Tebow has belonged to Clay and Lexie Ashurst, of Lusk, Wyoming, two times. And they don’t feel a bit foolish about it. They purchased the big bay horse as a four-year-old in 2011 and sold him the fall of 2012. The pair were reunited last fall and have seen success in Top Hand Competitions since. “We originally bought him from Debbie Lagan, in southern Colorado,” Clay said. “On the way back from WRCA Finals in Amarillo, Texas, I had called Debbie and told her I was going to sell him and she thought she wanted to buy him back.” Clay sold Tebow only after using him at Finals. Lagan owned the horse again until last fall, when the Ashurst bought Tebow back. The Ashursts run a string of good looking, mostly registered quarter horses, and Tebow doesn’t necessarily fit the bill; though he has earned his position in the Ashurst herd. Upon picking up Tebow for the second time, Lexie had trepidations. Clay and Tebow were invited to two top hand competitions thus far in the ranch rodeo season. Rockn’ Western Rendezvous featured its inaugural Top Hand Competition June 4 in conjunction with its ranch rodeo at The Ranch in Loveland, Colorado. Clay tied for first with Chris Potter, with the tie breaker event being the penning, in which Potter placed higher. Clay landed second again in his second top hand competition, Colorado Championship Ranch Rodeo, June 24 and 25, in Hugo, Colorado. Tebow, the “darn fine cow horse in a big ugly package,” as Clay describes him, helped secure the Top Hand Award of the ranch rodeo. Each top hand competition featured three individual events: freestyle reining and cow working, penning, and calf roping. In the freestyle reining pattern, contestants were judged on their ability to change leads, do large, fast and small, slow circles, stop and roll back both directions, stop and back up and spin. The team scored 212 and 219, respectively, and fourth places in the long and short rounds at RWR and tied for third at CCRR with a 238. Penning in Loveland consisted of cutting out one steer and consequently penning it. In Hugo, two cattle needed to be cut and corralled. “Sorting was fun but kind of anticlimactic. Everybody got along pretty good except one guy who had back luck. Fine event,” Clay said. At RWR, Clay and Tebow landed third in both rounds of penning, and in Hugo’s solo round of penning, placed fifth. The final event and Clay’s favorite was calf roping in which he and Tebow swept the board. 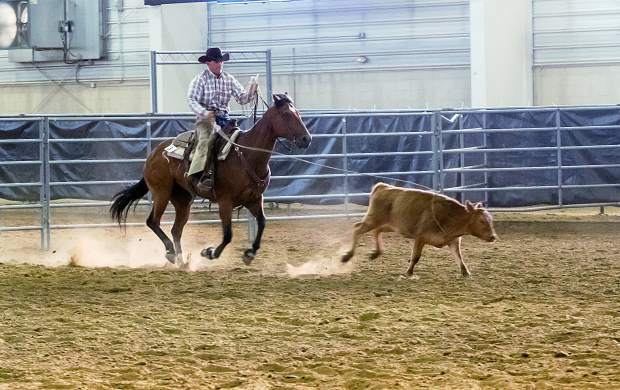 “In calf roping, you can sort a cow and calf or calf itself through gate, rope it and tie it down,” Clay said. Tebow has proven that purchasing back the bay was worth it. The Ashursts are excited to spend the summer with their favorite bay gelding. The Ashurst have no immediate plans to sell Tebow again, but nothing is set in stone. Clay and Lexie work for Four Three Land and Cattle and Clay ranch rodeos on the Four Three/FX Bar Ranch Team.